Olympic View Golf Club, aptly named for its beautiful views of Washington State’s Olympic Mountains, is located just 20 minutes outside of Victoria’s downtown core. If some of the golf shots on this target venue quicken your pulse, the tranquility of Olympic View’s setting should help to calm and center you. Olympic View boasts tranquility and nature, accentuated by 12 lakes, two waterfalls, beautiful mountain views, soaring eagles, and roaming deer. The 17th hole encompasses enough natural beauty for an entire course. From the tee, aim toward a breathtaking 40-foot waterfall that frames the green 455 yards away. This signature hole plays through a steep, narrow valley past a huge rock column and an elegant Japanese garden. You will quickly recognize why Olympic View consistently rates among top golf courses on Vancouver Island, including a four star rating by Golf Digest as Best Places to Play in 2009. Complementing your outstanding golf experience, Olympic View is home to the award winning GBC Golf Academy. The instructional team, recognized with several distinguished PGA of BC awards, provides private and group lessons, corporate clinics, and the extremely popular multi-day golf school. Before and after your game, visit Forester’s Bistro & Bar with a wrap around patio offering panoramic views of the first, tenth, and eighteenth holes. The fresh locally inspired menu prepared by a passionate culinary team features the best of Vancouver Island cuisine. Specializing in corporate golf events, picturesque weddings and memorable banquets, Olympic View is the location of choice with professional coordinators that facilitate events from start to finish. Offering an elegant ceremony and reception venue, brides can be certain that the team will cater to every need, ensuring no detail is missed. For special celebrations, meetings, banquets and golf events Olympic View will make your day extraordinary. Olympic View Golf Club is a proud member of the Audubon Society, doing its part to preserve and protect the environment. Consistently recognized for its efforts in environmental stewardship, Olympic View continues to appreciate nature’s beauty that surrounds this one of a kind golf course. 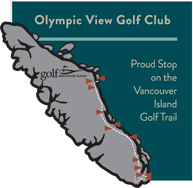 Make GolfBC’s Olympic View Golf Club your first choice for golf!